challenging schedule, is "Get cape. Wear cape. Fly!!!!" In this installment of my continuing series, I'm introducing you to another female pilot who defines what it means to be an active aviator. Author, pilot, CFI and TV host/personality MayCay Beeler has spent her entire aviation career knowing what she wants and then going after it. Beeler is not unlike some of the other female aviators I write about, in this space and also in the five magazines currently publishing my features. When asked why I seem to focus more on female aviators, I like to say it's simply because so much aviation media coverage is about men, and I am just trying to claim my part of the "softer, gentler" niche. And besides, it might be a Mars/Venus thing, but nearly all the women I know in aviation and business possess amazing skills to balance too many plates on too many sticks and keep them all spinning simultaneously. Based at KGSO (Piedmont Triad Int’l Airport- Greensboro/Winston-Salem/High Point) NC, Beeler juggles five freelance jobs, appears on TV weekly, and flies most days. She's flown 30 different aircraft including a Liberty XL-2, Cessna 172s, Cessna 150, a Piper Arrow, Tecnam Eaglet LSA and experimental Questair Venture kitplane (where she holds world records, see below). As a CFI/CFII/ATP, she instructs at Triad Aviation Academy (KGSO) and for the Guilford County Sheriff’s Air Support Unit. She's a TV Host/Personality for WFMY News 2 (CBS-TV) in Greensboro, NC, hosting Aviation Update segments, and is a regular TV Host for recurring weekly TV Cooking segments for Food Lion Grocery. Other "on-demand" TV work includes a gig for AOPA, serving as “One Week Ready to Solo” anchor at Sun n Fun ‘15. As an award-winning author, she wrote a true crime book about an infamous cartel pilot/cocaine smuggler; and she's a sales team member of the AEAC (Aero Electric Aircraft Corp) Sun Flyer - the first practical solar electric trainer airplane. Yes, this is one very busy lady. Airplanista: Let's start with your unusual but also beautiful first name. MayCay Beeler: MayCay is a nickname for my formal name Mary Catherine (named after my grandmothers). My Dad gave me this nickname as a youngster, citing my spunkiness. Mary Catherine was too conservative. MayCay fit me much better and it stuck! Airplanista: As a television weather anchor, did you ever use your aviation weather knowledge on air? MayCay Beeler: Yes, I did. I am no longer in that role. I anchored the weather for TV News in the early 2000’s for my local network affiliates ABC-TV station and briefly for NBC-TV. Viewers got a kick out of my saying “niner” when I mentioned pressure. Airplanista: Do you feel that analyzing weather from an aviation perspective gives you a competitive advantage over other weather anchors in your market? MayCay Beeler: Yes, simply because I understand it from an up close and personal perspective - having lived it in the air on a regular basis. Frankly, every TV weather person/meteorologist has access to the same weather sources and forecasts. Anyone can pull that data, create the graphics and recite the numbers on TV. But to personally experience the weather as a pilot, and have an intimate understanding of fronts and pressure systems by flying IN them, that gave me an edge the viewers enjoyed, especially when I would use graphics and take them on a “weather flight”. in the Questair Venture experimental airplane. Airplanista: Tell us about the world aviation records you've set in your Questair Venture aircraft. MayCay Beeler: I met the test pilot for Questair when I produced a national story about the “fastest egg in the East” for the TV show “PM MAGAZINE” I was hosting. I was already an instrument-rated pilot at the time, and eventually set world records in the Venture and did a TV show about it. My record breaking flights included FAI Class C-1B time to climb to 3,000 meters, speed over a 3 KM and 15/25 KM course, closed circuit 100km, 500km and 1,000km speed without payload, and speed over a recognized course Winston-Salem to Kitty Hawk, 358.82 mph. In 1991, I flew my time-to-climb to 3,000 meters record flight just one month after giving birth. Airplanista: Is flying a family affair? Do you have parents, siblings, husband, partner or kids that participate in aviation? How did you get interested in flying? MayCay Beeler: Past boyfriends and husbands were pilots. My son flew with me while I was pregnant with him - he earned an honorary CFI certificate in utero! No kidding! I was eight months pregnant during that grueling CFI check ride. The FAA examiner felt my son deserved an honorary temporary certificate after "we" passed with flying colors. Still have it framed! After I divorced, I met my soul mate while researching a true crime documentary - he is now deceased. He was an infamous pilot with a colorful history! Read his biography for more (Buccaneer- info included later)! It will blow you away. Can’t make this stuff up! My son has flown with me all his life. Having a flight instructor for a Mom ensured he soloed on his 16th Birthday, and earned his Private Pilot Certificate on his 17th. He is a better pilot than I will ever be. Exceptional. In his genes! He is being awarded his BS Degree in Aerospace Engineering with honors from NC State U this May. He is a world-champion RC aircraft pilot! We have our most enjoyable mother-son moments when we fly together. 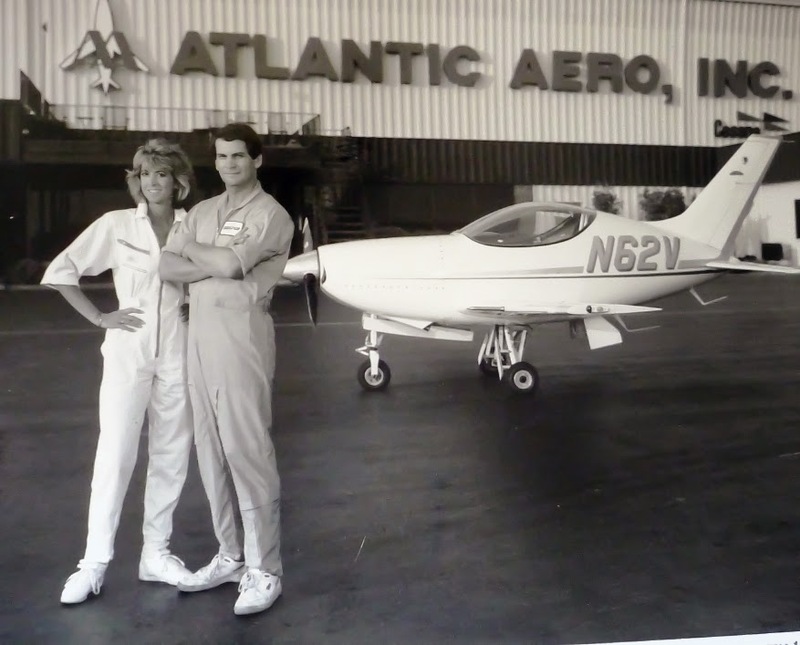 Have been on many flying adventures together including our trip to Norman’s Cay, Bahamas where we produced the documentary “Return to Norman’s Cay”. Airplanista: As creator of The Diva Flight Experience, explain what this program is and what the goals of the program are, both current and future. Also give me contact info so I can publish the URL or anything else you want to have published. Airplanista: In your opinion, what is the root cause keeping most women from flying now, and how did you personally overcome any of these same obstacles to pursue your successful aviation career? MayCay Beeler: This is tough. As natural caregivers, we tend to put others first. It's hard to juggle it all. I have struggled with it. As moms, we put our kids first. The moms that successfully juggle kids and career are super gifted; I have the utmost respect for them. It was hard for me. When you see how fast your kids grow up, you know how priceless it is to be with them and nurture them while they need you. It’s a tug - career and/or family. It's an individual angst many of us struggle with. No right or wrong. I believe the role of caregiver - be it looking out for our kids, spouses, partners, aging parents, whatever, inhibits a lot of women from flying because they are too busy and/or feel guilty or obligated to put others first. Plus, they don’t know they CAN fly! As a traditional boy's club, flying professionally is something most women never even consider! They don’t know it's an option. It is! We must encourage them and let them know it can be done! Airplanista: What is the one thing both male and female pilots can do right now to increase the female pilot population? MayCay Beeler: Take a gal flying! Cheer her on! Share the magic aloft. Spread your contagious enthusiasm! Let her know anything is possible, and any dream is attainable if she is willing to work for it! Airplanista: Has being a pilot opened any doors in your career or allowed you to pursue stories that many other journalists overlooked? MayCay Beeler: Oh yes! It was my role as a pilot that bonded me to an infamous prison inmate/cartel pilot who had never told his story. When I first contacted pilot Jack Carlton Reed in prison for research on a true crime documentary I was producing, I never imagined I would become this infamous inmate's biographer and last confidante. The acquaintance led to my book "Buccaneer - The Provocative Odyssey of Jack Reed - Adventurer, Drug Smuggler, and Pilot Extraordinaire." His story had never been given to any other journalist. In doing research for our book, which was a collaborative effort at the end of his life, I would stumble upon a piece of information that would change everything. This book is the stunning account of Reed’s provocative life with a twist of fate that will make you believe in miracles. The book is available on Amazon and booksellers worldwide. Airplanista: Describe a perfect day flying. MayCay Beeler: Just me and my flying machine, the sassy Liberty XL2, living Richard Bach’s beautiful quote: “The highest art form of all is a human being in control of himself and his airplane in flight…urging the Spirit of the machine to match his own.” I am ONE with the plane. Never have I felt so graceful! Airplanista: Freestyle question, your chance to soap box anything or tell my readers something about MayCay Beeler that they do not know now. MayCay Beeler: I had barely turned 16 when I first went to work on a dude ranch in Jackson Hole, Wyoming for two summers. It was my love of horses that lured me there! I love to ride, and later transferred that passion to planes. I was one with the horse; I am now one with the plane. It’s all about freedom. My soul is in the sky. It is here I feel most alive. “Come to the edge,” Life said. “Come to the edge.” Life said.